Regarding the probability of a swarm of cometary fragments hitting the Earth, Boslough et al. (2013) claimed that the YDB event is “statistically and physically impossible,” whereas Napier et al. (2013) argued that such an encounter in the late Quaternary is a “reasonably probable event.” We outline the latter hypothesis below; details and prime references are given in Napier (2015). With currently accepted impact rates, there is an expectation of one extraterrestrial impact of energy 100–200 megatons over the past 20,000 y, which is inadequate to produce the observed global trauma (Bland and Artemieva 2006). However, near-Earth surveys of hazardous interplanetary objects are limited to the past ∼30 y, and extrapolation of con- temporary impact rates to timescales beyond 104 y cannot be justified without further investigation, especially for comet populations. Comets entering Earth-crossing orbits, which are thus potential collision hazards, may be long-period (LP) objects (200 ky ≲ P ≲4 My), Halley-type (HT; 20y≲P≲200y),Jupiterfamily(JF)–type(4y≲P≲ 20 y), or Encke-type (P ≲ 4 y), the latter currently with a population of 1. The LP system is spherical, containing as many comets in retrograde orbits as in prograde, and derives from the Oort cloud. 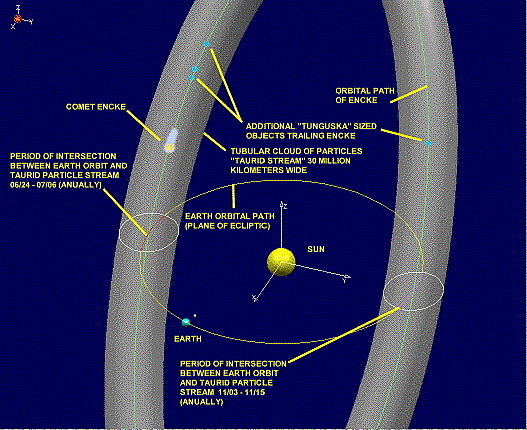 The HT system is spheroidal, with a preponderance of comets in direct orbits, while the JF and Encke comets are in direct orbits close to the plane of the ecliptic. There may be ∼100 active comets with diameters over 2.3 km in the HT population and ∼450 in the JF system, although these numbers are very uncertain. Both these populations are evanescent, with a typical JF comet surviving for only 200–300 revolutions (∼3000 y) before disintegration is complete. To maintain a steady state, new comets must enter the JF system about once a decade and the HT system about once every century. The likely replacement reservoirs are the Oort cloud and a trans-Neptunian population of icy bodies on the fringes of the planetary system, the latter of which was largely unknown 25 y ago. Its properties are still being explored, but it is estimated to contain 8 billion comets more than 1 km in diameter; the Oort cloud may contain a trillion comets. Dormant comets, called “centaurs,” have been detected in transition from these reservoirs to the JF population. They are in unstable orbits crossing those of Jupiter, Saturn, and Uranus, becoming more unstable as they move inward and becoming active when they cross the water-snow line at ∼2.9 astronomical units (au) from the Sun (1 au p the mean Earth-Sun distance). The archetypal centaur, Chiron, currently orbits between Saturn and Ura- nus. 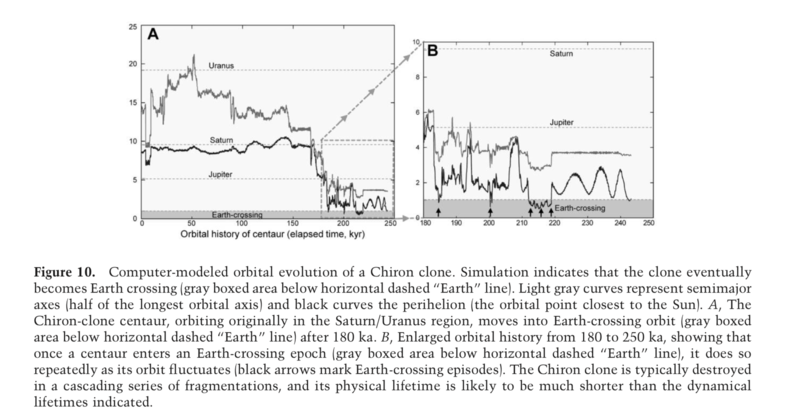 Its half-life for ejection from the solar system is about 1 My, and that for evolution into a Jupiter- crossing orbit is 0.1–0.2 My (Hahn and Bailey 1990). Population-balance arguments indicate that at any given time there may be four to seven centaurs larger than 240-km-wide Chiron inside 18 au and about 30 that are 1100 km in diameter. Their orbits are chaotic and can be followed only statistically, because small changes in initial conditions induce large subsequent variations (the butterfly effect). Eventually, about half the centaurs in Chiron-like orbits become Jupiter crossers at some point, and a tenth become Earth crossers, moving in and out of Earth-crossing epochs repeatedly (fig. 10). The mass distribution of centaurs is top-heavy, and the replenishment of the JF and comets in Encke- like orbits is erratic, with occasional large injections of mass into the inner planetary system. A 250-km comet with typical density 0.5 g/cm3 has 2000 times the current mass of the JF and 1000 times that of the entire current near-Earth asteroid system. In terms of terrestrial interactions, its disintegration products, during its active lifetime, will thus greatly dominate over those of the near-Earth asteroids. For a 100-km comet, the factors are 128 and 64, respectively. The timescale for an enhancement in mass of the near-Earth environment is ∼0.5 My for a factor 1000 and ∼0.03–0.1 My for a factor 100. The main modes of disintegration of a comet are sublimation and fragmentation. The latter has two prime modes: tidal splitting, in which the comet breaks into fragments after a close planetary or solar encounter, and spontaneous splitting, in which the main nucleus stays intact while a number of short-lived cometary fragments split off, often disappearing from sight after a few weeks or days. Fragmentation is the major mode of comet disintegration: the total mass lost by small fragments repeatedly spalling from the nucleus may be comparable to the mass of the nucleus itself (Boehn- hardt 2004). A 100-km comet of mass 2.5 # 1020 g, with perihelion of ∼0.34 au, loses typically ∼1016 g of material through sublimation during each peri- helion passage, but ∼1017–1018 g during a splitting event, equivalent in mass to ∼107–108 Tunguska bolides. Such an event may happen anywhere along its orbit. For a comet in an Encke-like orbit, such fragmentations are expected every third or fourth orbit (di Sisto et al. 2009). These splittings may occur anywhere but have a tendency to occur near perihelion. Debris from disintegrating comets readily spreads out to cross sections much greater than Earth’s diameter and so is encountered more frequently, as can be seen by the prevalence of meteor showers in the night sky, the products of cometary decay. During dormant phases, in which sublimation decreases, an active comet becomes more asteroidal in appearance through acquiring a mantle of dust and heavy organics. These phases may persist for up to 40% of the lifetime of the comet. The structure of the meteoroid population in the inner planetary system has been determined both through numerous individual studies of meteors, going back to the 1950s, and from recent large-scale radar and optical surveys. As many as 100 meteor showers are accepted by the International Astronomical Union, but a total of 230 showers and shower components have now been identified from video- based meteoroid orbit surveys (Wiegert et al. 2009; Jenniskens et al. 2016). Some of these streams are multicomponent, indicating that they result from cascades of disruption of a parent body into subcomponents. A prominent feature of this orbiting material is an interrelated system of meteoroidal material called the Taurid Complex. At least 20 observed streams are embedded within it, with the meteoroids moving in low-inclination, short-period, Earth-crossing orbits. Many of these streams contain bodies of killometer and subkilometer dimensions, including the 4.8-km-wide Comet Encke. A limitation of meteor surveys is that they detect only material that hits Earth. It is therefore possible that the number of meteoroid streams associated with the progenitor of the Taurid Complex is greater than the ∼20 that have been observed. A dust trail along the orbit of Encke has also been detected, with a lower mass limit of 7 million tons inferred from the Spitzer infrared space telescope (Reach et al. 2007). This trail, which is well away from Earth intersection, extends around the entire orbit and would disperse in some revolutions. Such trails, distinct from comet tails, are a generic feature of short-period comets. The Taurid Complex is best explained as debris from the breakup of a large comet (∼100 km) in a short-period, Earth-crossing orbit that recently arrived from the centaur system (Clube and Napier 1984; Steel and Asher 1996). The orbits of the meteor streams and their associated bodies precess and disperse because of the influence of Jupiter and Saturn. From the observed dispersal of the Taurids, Steel and Asher (1996) concluded that the progeni- tor comet was at least 20,000–30,000 y old. Comet Encke, part of the Taurid Complex, never approaches closer than 26,000,000 km from Earth at present. The fragments of a splitting event disperse as they move away from the comet. Recently released cometary material forms an elongated, dense trail typically a few hundred Earth radii long and 10 radii wide within an orbit (Napier 2015; Napier et al. 2015). Taking account of orbital precession and nutation, the recurrence time of encounters between Earth and one such debris swarm in an Encke-like orbit is t ∼ 500/j My, where the effective cross-sectional area j of the swarm is in Earth radii. If there is an average of one such swarm at any time, we expect passage through it about once in 50,000 y, in the course of which the Earth will encounter 1017/j ∼ 1013–1014 g of material over a few hours, entering the Earth’s atmosphere at 30 km/s. The debris so encountered will generally be a mixture of dust and larger fragments, energetically equivalent to the impact of ∼1000–10,000 Tunguskas and with the potential to create severe biotic and climatic disturbances (Hoyle and Wickramasinghe 1978). The presence of multiple meteor streams within the Taurid Complex, including “asteroids” orbiting within them, indicates that the original comet evolved via a cascading hierarchy of fragmentations. Over its active lifetime, the original comet and its offspring may have generated several thousand trails of mass ∼1015–(2 # 1017) g, spreading and dispersing over time, containing subkilometer bodies that continued to generate meteoroid streams as they disintegrated. Asher and Clube (1993) demonstrated theoretically that the 7∶2 mean motion resonance with Jupiter plays an important role in shepherding Taurid meteoroids, building up a swarm of enhanced density over a timescale of 1000 y. The existence of this swarm has been confirmed through epochs of enhanced fireball activity going back ∼60 y (Asher and Clube 1993; Dubietis and Arlt 2007; Reach et al. 2007) and possibly through Far Eastern historical records going back a thousand years (Hasegawa 1992). More meteoroids struck the Moon over five days in 1975, during a passage through the daytime Taurids, than over the five years of the lunar seismic record. Thus, over the late Quaternary lifetime of this exceptionally large short-period, Earth-crossing comet, one or more encounters with a swarm of bolides whose aggregate kinetic energy is comparable to that of a nuclear war is a “reasonably probable event” (Napier et al. 2013). Firestorms from Encounters with Comet Swarms. Although the blast damage from the Tunguska impact covered 2000 km2, the area of forest that was ignited was only a tenth of that (Florenskiy 1965). Conditions in the Siberian taiga of the twentieth century may not, however, extrapolate reliably to Earth’s Northern Hemisphere ∼12,800 y ago. The radiant energy of a megaton-class nuclear explosion unfolds over a few seconds, comparable to that from a Tunguska-type event, and the effects of an airburst are probably similar for both types of energy release. Therefore, we may use studies of wildfires following a nuclear war (e.g., Crutzen et al. 1984; National Research Council 1985; Mills et al. 2014) as rough guides to the consequences of multiple impacts. Crut-zen et al. (1984) quote minimum forest fire areas of 500, 1000, and 2100 km2 following 1-, 3-, and 10- megaton explosions, respectively, while the maximum spread areas quoted by Hill (1961) are about a factor of 10 higher. The ignition threshold for wood is about 4 # 108 ergs/cm2, applied for 1–20 s. If the burn area required to produce the increase in soot and char- coal measured at the YDB is 107 km2 (eq. in Wolbach et al. 2018), then an energy input of ∼4 # 1025 ergs is required, that is, about 103 megatons. Assuming that three-quarters of the external input does not directly affect flammable areas of Earth, then approximately four times this energy is re- quired to produce wildfires, possibly reduced by a factor of a few times (Hill 1961). This equals the kinetic energy of 1013 g of material entering the Earth’s atmosphere at the entry speed of Taurid material (30 km/s). The best explanation for the available evidence is that Earth collided with a fragmented comet. If so, aerial detonations or ground impacts by numerous relatively small cometary fragments, widely dispersed across several continents, most likely ignited the widespread biomass burning observed at the YD onset.